La Paz is an impossible city. It sits at the bottom of a steep valley. 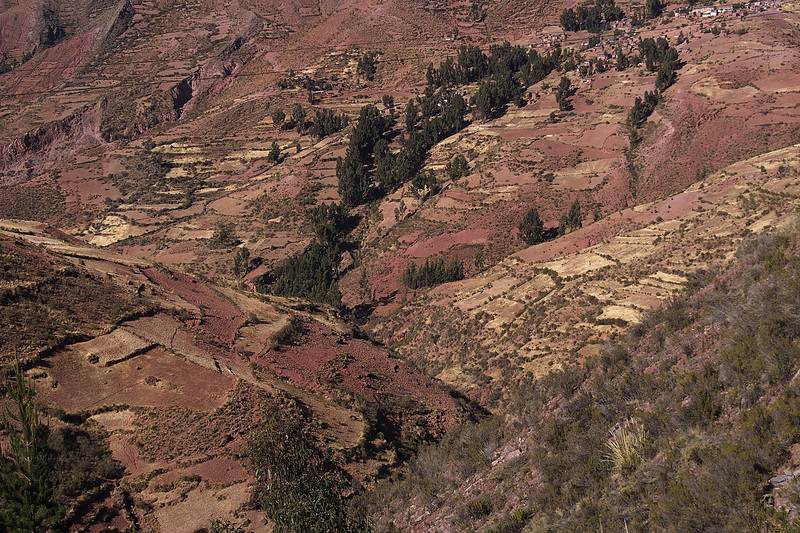 Six hundred metres above, on the Altiplano, El Alto spills over the cliffs into the ravine, merging with La Paz. 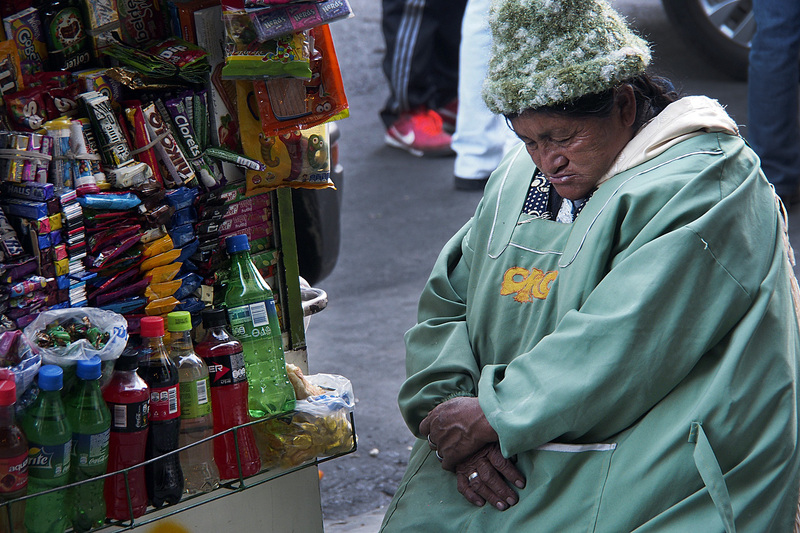 It is Bolivia in a giant nutshell: the mostly poor live in the sprawling, chaotic neighbourhoods of El Alto, while the middle class and rich live in the well-kept neighbourhoods of La Paz in the valley below. Looming over it all is Illimani. At 6,439 metres, it is the tallest peak in the Cordillera Real and the second highest peak in Bolivia. 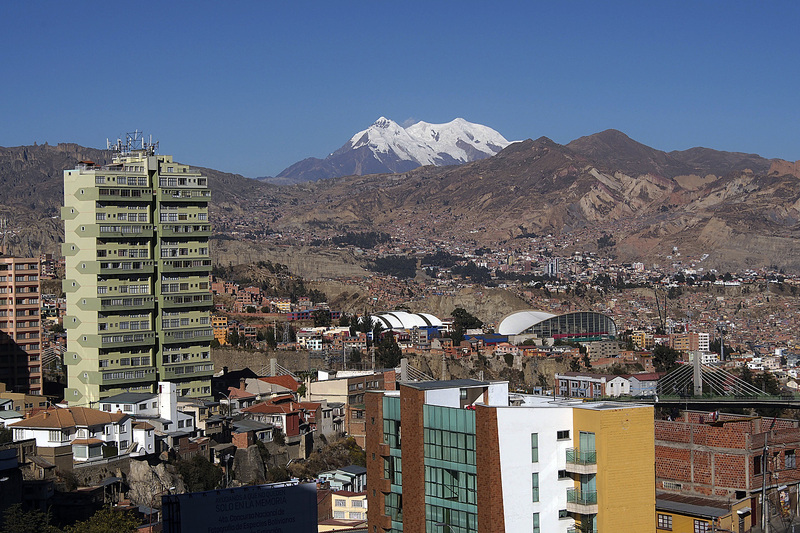 View of La Paz from Sopocachi with 6,439-metre-high Illimani in the background. Connecting the two are a myriad of precarious roads snaking up and down the steep cliffs as well as the newly built Teleférico, the first of several cable cars planned for this city in an attempt to curb car use and battle pollution. The Telefrico between El Alto and La Paz. 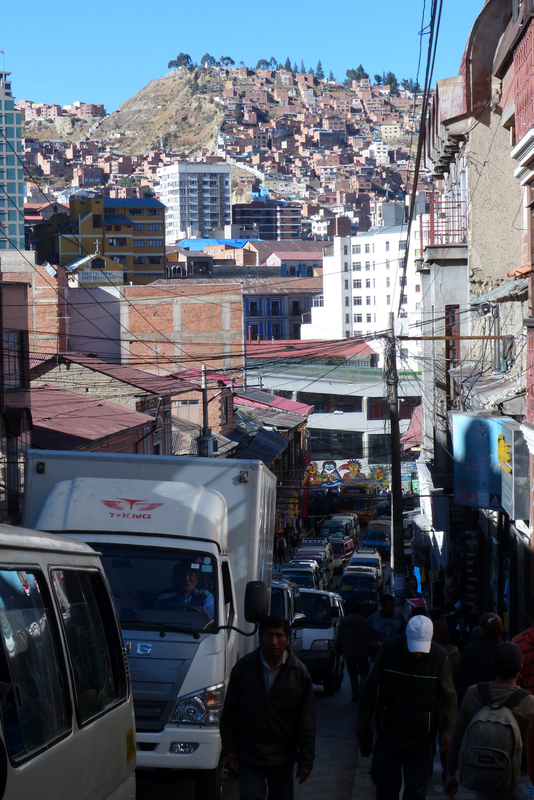 Traffic-choked streets in La Paz. 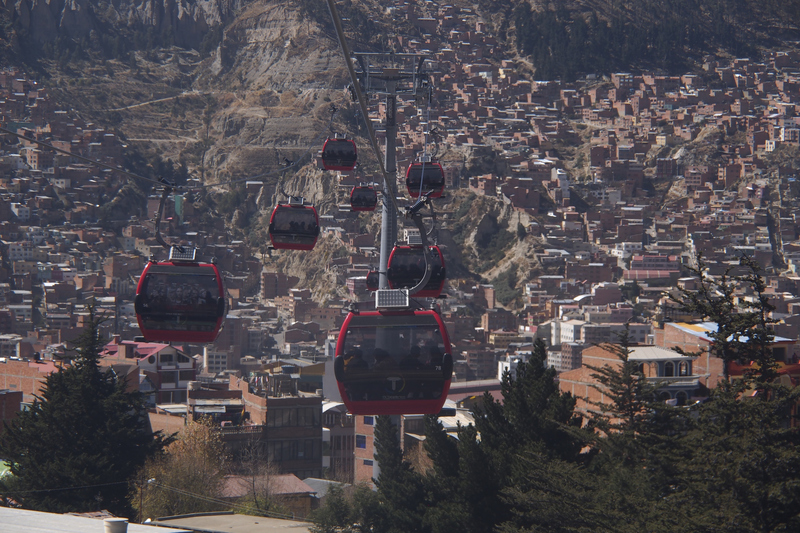 Rather than cycling down into traffic-choked La Paz, and having to grind 600 metres all the way back up again upon leaving, we decided to stay in El Alto near the Teleférico. This turned out to be a good decision. Ellen and Elmar at 4,200 metres near Confital. 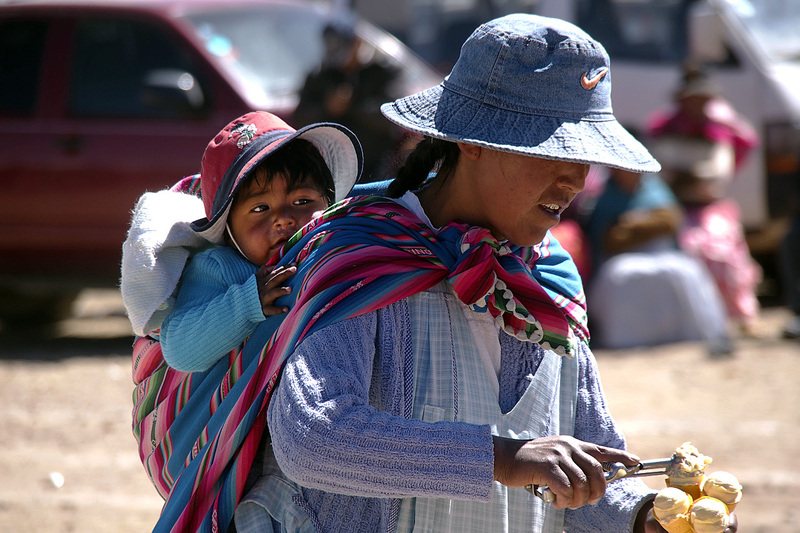 Getting to El Alto from Cochabamba took us six days. The first three were spent labouriously climbing up to El Cumbra Pass at 4,500 metres over about 140 kilometres. 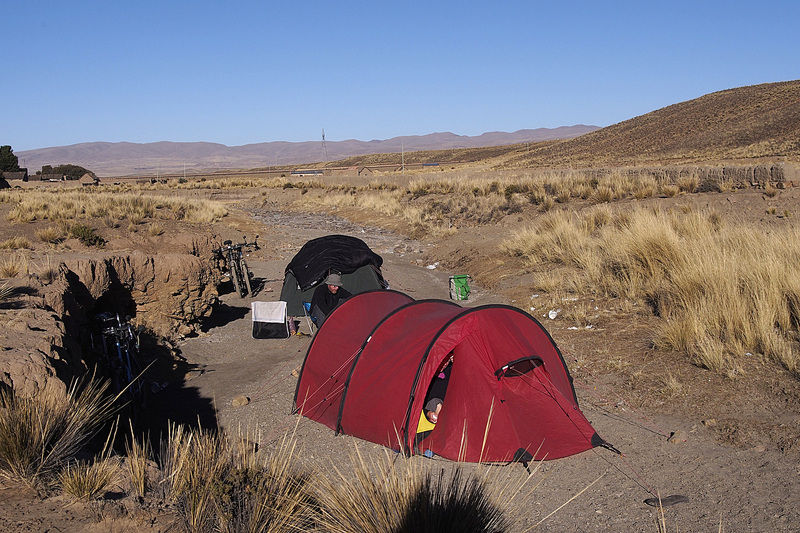 The final three days and 240 kilometres were on the relatively flat Altiplano at an elevation of about 4,000 metres, and for most of it we had our own private bike path on a highway under construction. 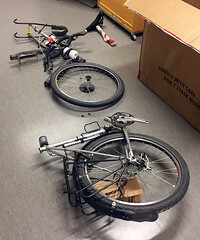 It made the cycling much safer than trying to share the road with speeding trucks, buses and cars. 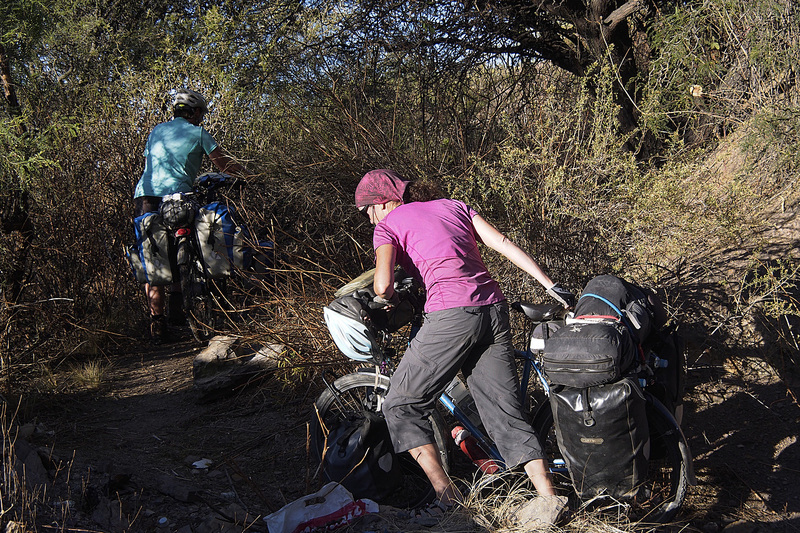 Pushing through the bush to a camp spot on our way to La Paz. Along the way, we camped in some lovely spots. The first night we found a large flat area behind some brush above the highway with gorgeous views over the mountains looking back to Cochabamba, its lights winking at us when night fell. Sunrise over the mountains looking back to Cochabamba. The next night, in the town of Pongo, it was cold so we inquired about accommodation and were directed to the church. For a small donation we were given a room with eight bunks. Ellen, unfortunately, had a bout of altitude sickness causing her to vomit repeatedly. But a miracle pill resulted in her waking up feeling chipper and well enough to cycle higher into the mountains. 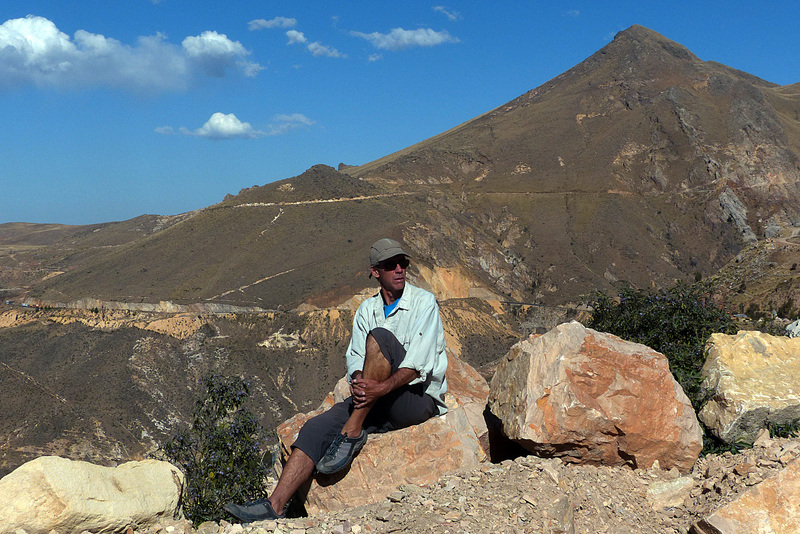 Taking a break from the climb back up to the Altiplano from Cochabamba to La Paz. With Ellen well enough to cycle we carried on and that night we camped in a wide river bed near the town of Leque Palca, where an old fortified adobe church sits crumbling on the edge of town. It dates from 1600 but it is unclear who built it. Camped in the river valley near Leque Palca. Adobe church in Leque Palca dating back to 1600. Girls in Confital near La Cumbre Pass. 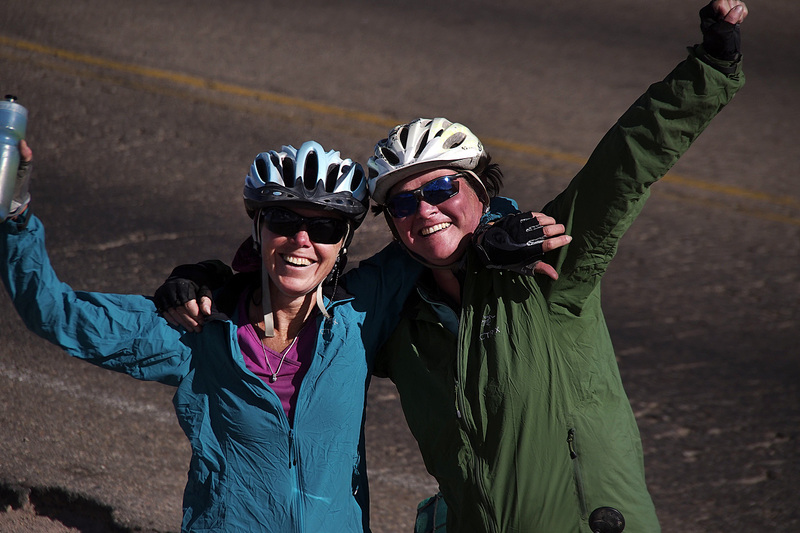 Jan and Ellen celebrate at the top of La Cumbre, 4,500 metres. On the Altiplano we camped beside an unfinished building one night and in a dry creek bed in the tiny town of Ajoya the next. A small delegation visited us after we had gone to bed, wondering who we were and what we were doing. 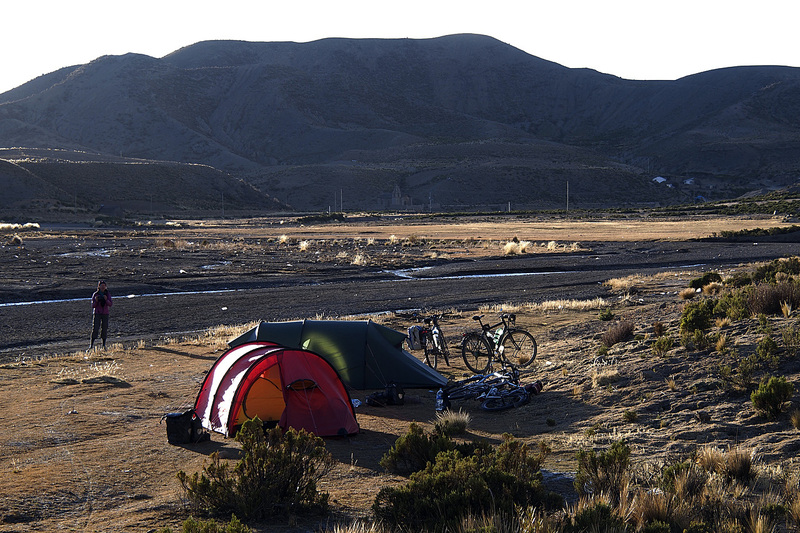 I crawled out of the tent and explained to them in my best Spanish that we were four cyclists on our way to La Paz and needed a place to sleep. That was okay with them and they walked back to town. 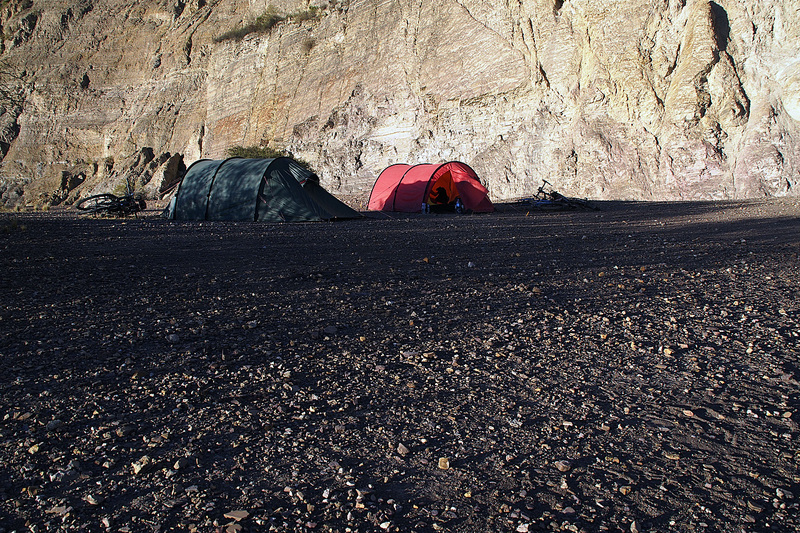 Camped in a field outside Culpapucho Belen on the way to La Paz. 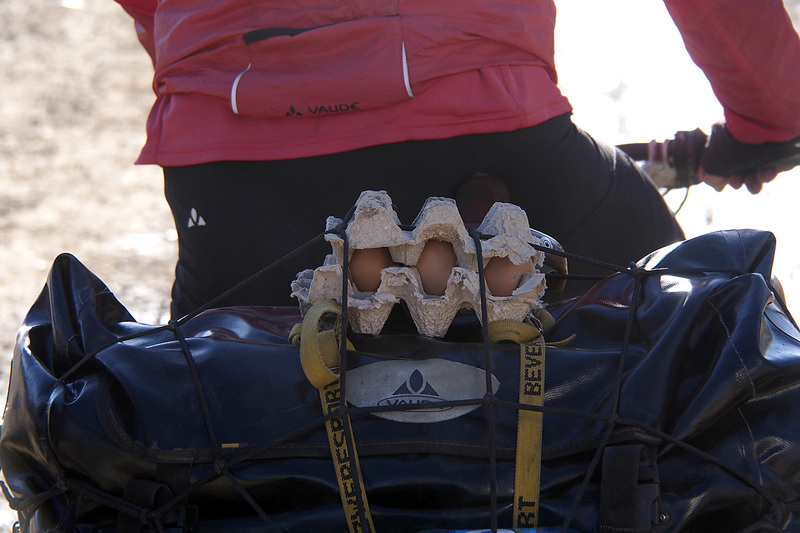 Precious cargo: eggs for breakfast. Creek bed camp near Ajoya, a small town on the highway to La Paz. 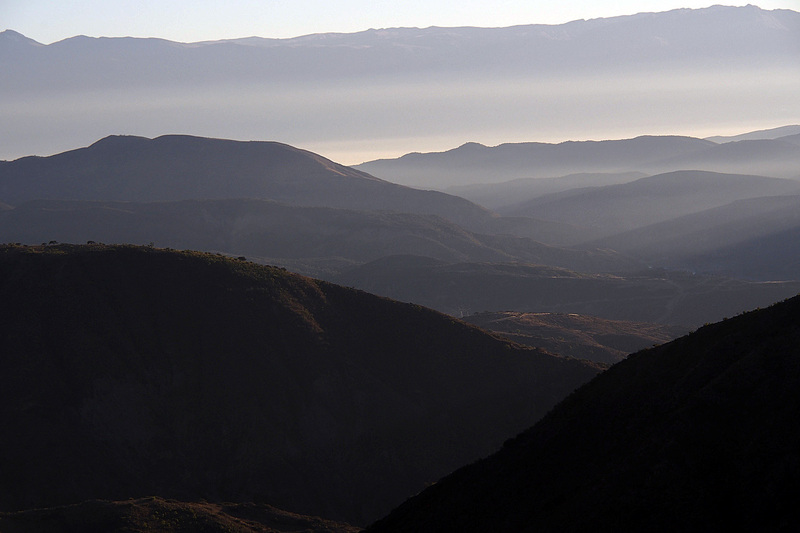 As we closed in on La Paz, the mountains of the Cordillera Real appeared on the horizon. Big 6,000-metre-plus peaks Huayna Potosi and Illimani punctuate the range which is part of the greater Andean Cordillera Oriental. It is an impressive sight. For many kilometres we enjoyed a private bike path as the highway is in the process of being twinned. Getting closer to La Paz with Huayna Potosi, 6088 metres, standing guard. Our private bike path did have some obstacles. Nearing the metropolis, we stopped at a small town where a festival was in progress celebrating Bolivia’s Independence Day. 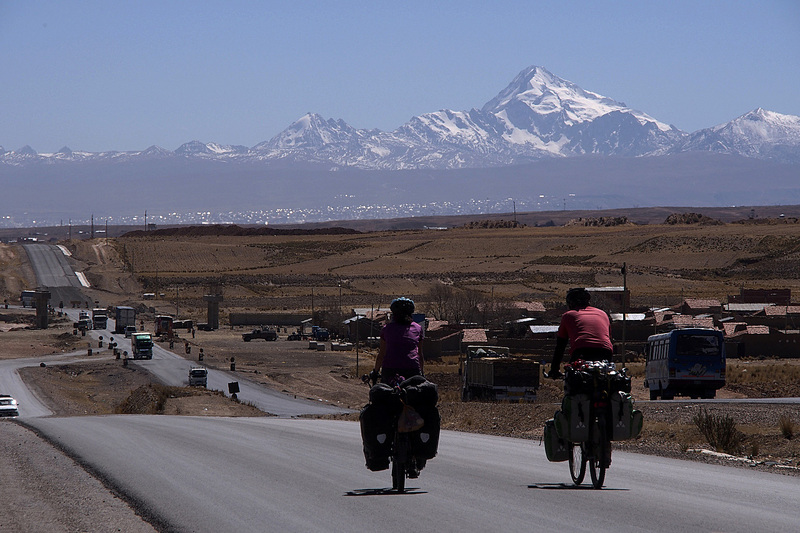 Entering El Alto, the traffic congestion, pollution and general state of chaos made for a stressful and tiring final couple of hours cycling until we found a hotel in the centre near the airport. Sharply dressed women at an independence day festival in a small town south of El Alto. The hotel was brand new with spacious rooms and close to the Teleférico. We made it our base for exploring La Paz using the cable car to get down into the city and taking cabs back up at night. The Teleférico is a bargain at B$3 (50 cents). The 30-minute-long nauseating cab ride on the twisty, hairpin roads back up cost 20 times that but was a safe and easy way to get back to our hotel. 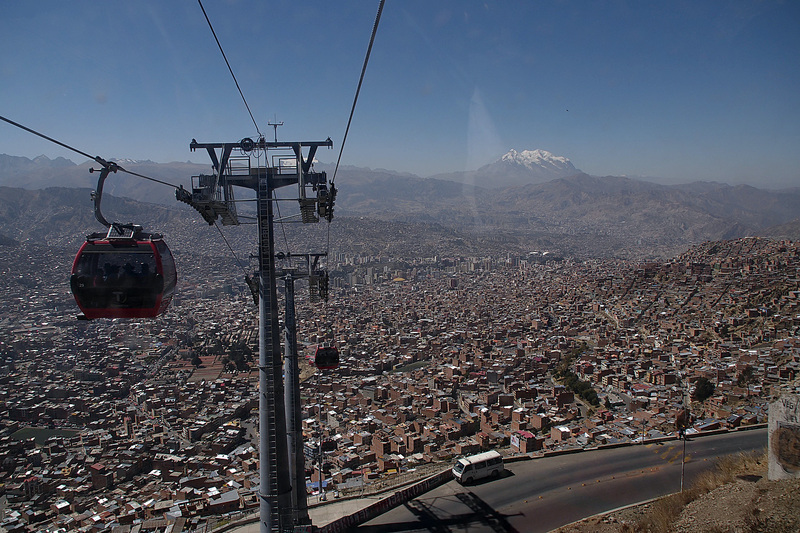 The Teleférico running between El Alto and La Paz. 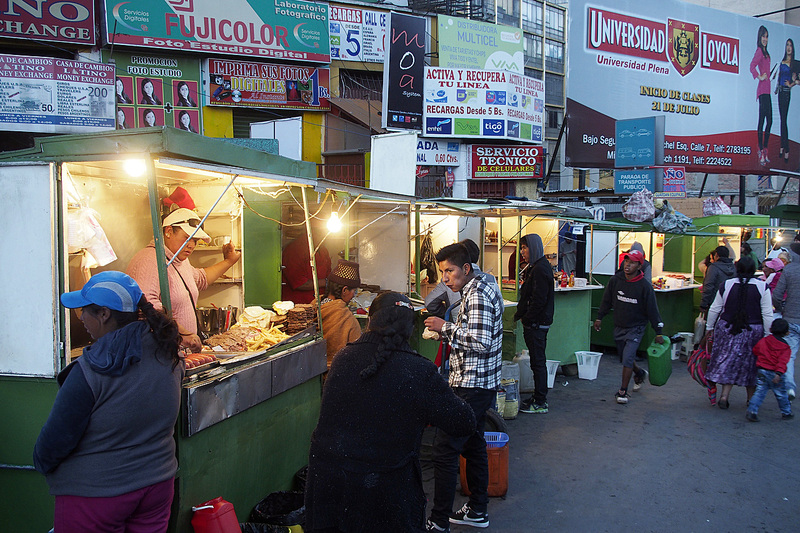 La Paz is a bustling, crowded, traffic-choked city. The rules of the road are somewhat taken into consideration but as a pedestrian you have to be careful, yet, a little bit aggressive or else you don’t get anywhere. Drivers repeatedly run red lights and block intersections. 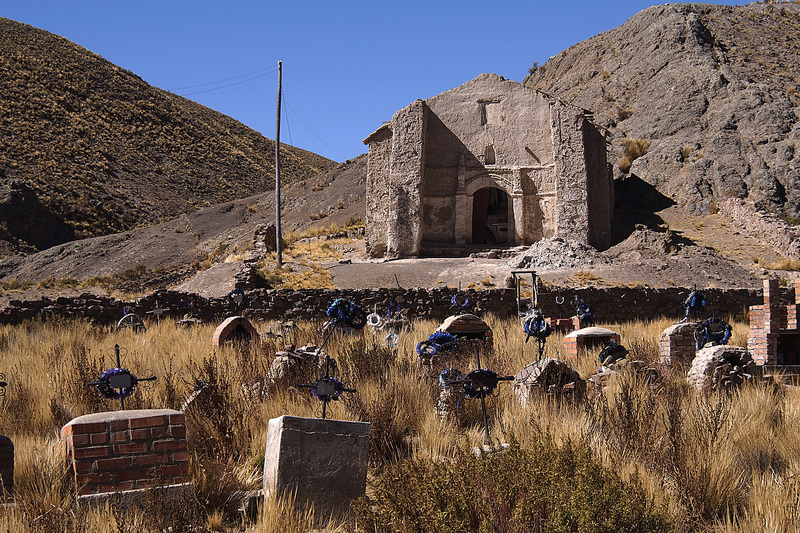 It would have been a nightmare to get around on the bicycle and we were glad we had chosen to stay in El Alto. Street food on Paseo El Prado. The contrasts of this city are visible everywhere. From the beautiful San Fransisco Cathedral, the shiny shops of Paseo El Prado and the apartment buildings of Sopocachi to the women with small children trying to sell anything from a blanket-covered spot on the sidewalk, the market stalls along seemingly every street and the filthy beggars asking for a hand-out. 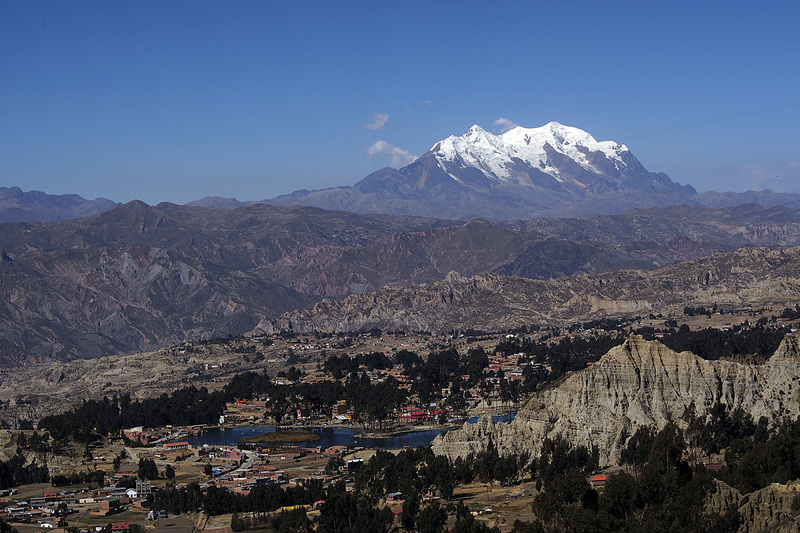 Looming over it all is snowcapped Illimani completing the picture of beauty and the beast that is La Paz-El Alto. Iglesia San Fransisco built in 1549. Iglesia San Fransisco built in the 16th century. Another tough day at the office selling candy and pop along Paseo El Prado. Looking down on the outskirts of La Paz with Illimani, 6,439 metres, looming over it. We spent three nights and two days wandering around this impossible city shopping for a few things we needed and eating in some of the finest restaurants as well as having ice cream at the Dumbo on El Prado, a popular family restaurant chain found in all major Bolivian cities. 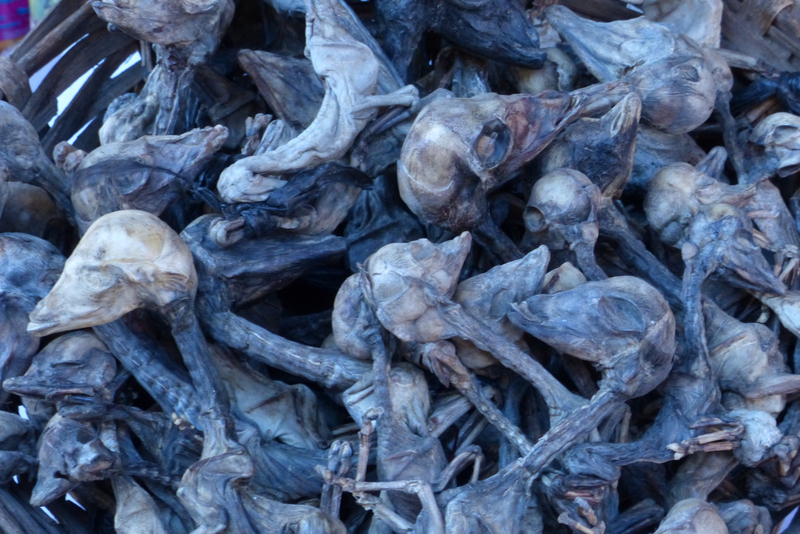 Dried llama fetuses for sale in the witches market. Didn’t need any of these. La Paz has summed up our Bolivian experience. It is diverse, throbbing with life and plagued with problems that are difficult to overcome in a developing country. But because of all these things, Bolivia, with its largely multi-cultural aboriginal population and the issues that come with that, is an exciting place to be. It feels much more alive than Chile and Argentina which is why we decided to stay here so long and cycle a big loop through this country. 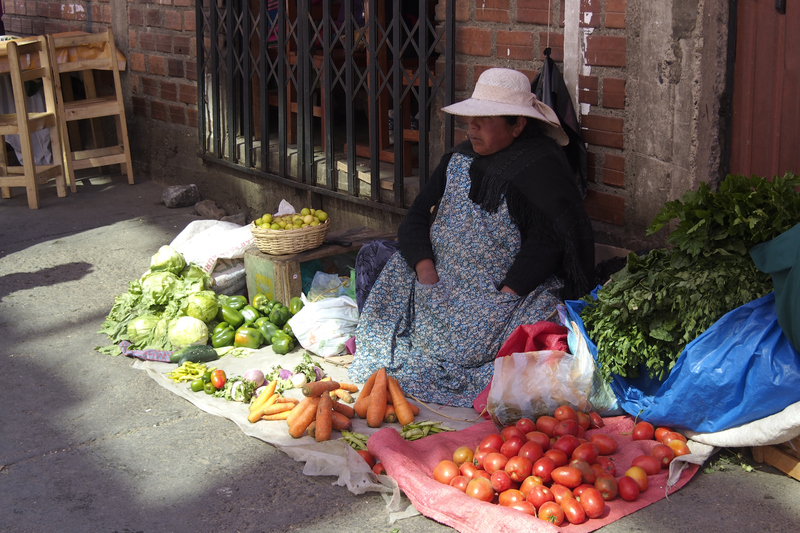 Vegetable seller near our hotel in El Alto. 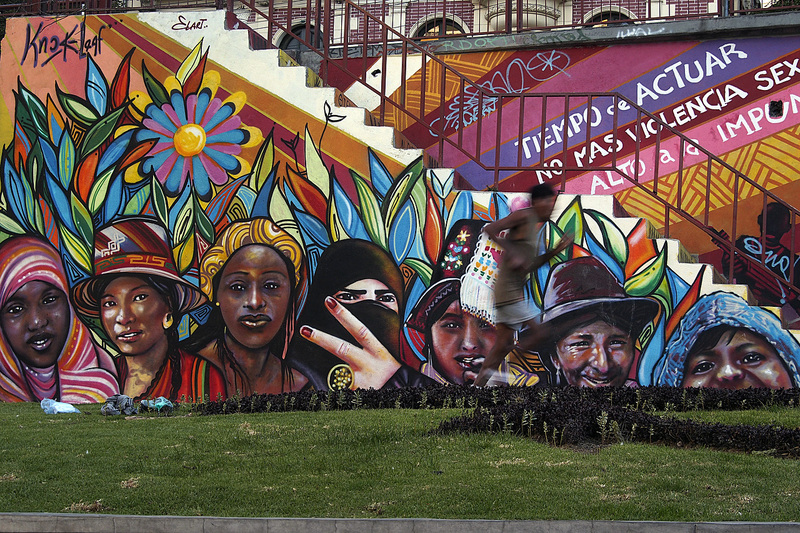 Mural on Avenida 6 de Agosto in La Paz. But like all good things, our time in Bolivia has to end and we will only have a few more days before we cross into Peru. Until then, we will head to Copacabana on the shores of Lake Titicaca. 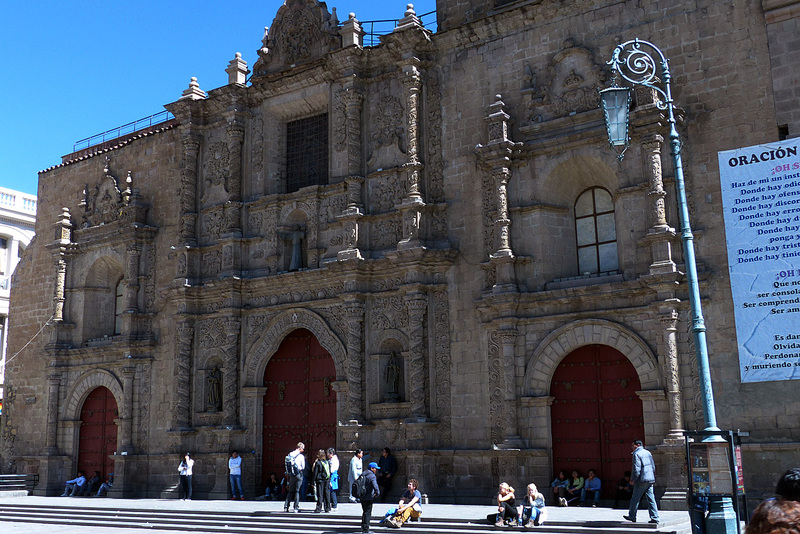 I wonder where the date 1549 came from for the church in La Paz. 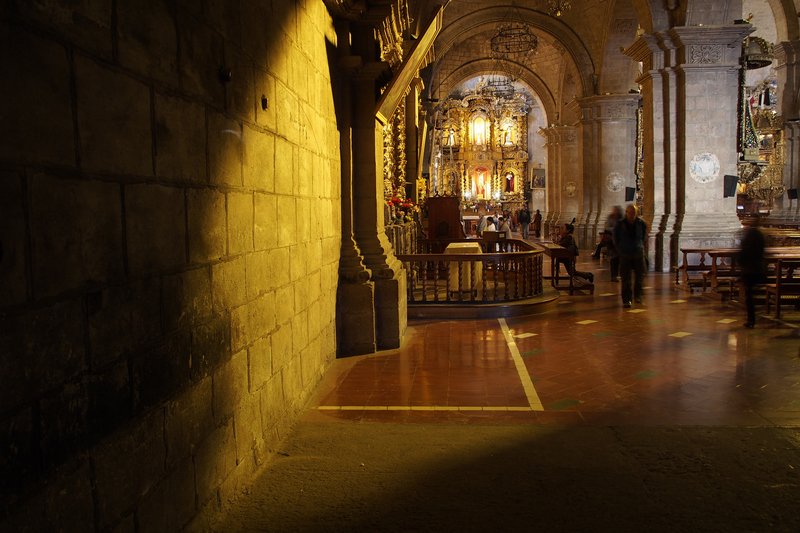 Your average gothic cathedral in Europe took 200 – 400 years to complete. Even this much smaller church would have surely taken at least 1 human lifetime if not two. And yet Columbus never got to the West Indes until 1492, and Bolivia would have been reached quite a bit later by the conquistadores. Possibly the date was when the first foundation stone was laid. I don’t remember much “development” in La Paz and don’t remember the big mountain. I think it was all dusty and smoggy. I caught a truck to a mine from there. Walked on an old Inca trail over a pass at 16,000 feet with small patches of snow and no vegetation. The snow patches were melting into the upper reaches of the Amazon basin. 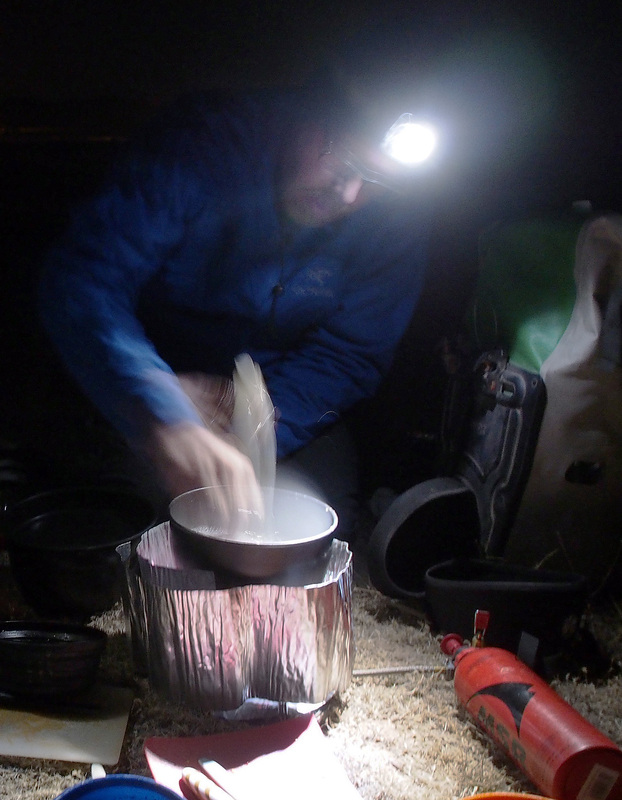 Camped where the first bushes straggled so I could find twigs to make a fire to cook with. Next day started down. And down, and down. At lunch time I was eating blackberries, at supper time I was eating oranges! Incredible journey you are having and sharing! This whole trip you both have been on with fellow travellers joining in has been amazing! I don’t know how you can keep going and keep getting energy to do that. I’m exhausted just reading and looking at the photos. Great job in keeping this journal. Good luck on your continuing travels. Glad to have you along. It is people like you who we meet along the way that make the journey all that more special.